It was like a telenovela, a Colombian soap opera. The fight between the mayor of Bogotá and the country’s powerful inspector general has dominated the headlines in Colombia since early December 2013. It was, as the New York Times put it, “an absurdist drama in which two actors alternately fascinate and irritate their audience with squabbling, philosophizing and the occasional kick in the pants.” On 20 March 2014, however, the leftist mayor was removed from office by Colombia’s president and is barred from public office for 15 years. This decision has not only an impact on local politics in Colombia’s capital but also on the peace process on Cuba between the Colombian government and the FARC. The clash between Gustavo Petro, the former mayor of Bogotá, and Alejandro Ordóñez, the inspector general, derives from Petro’s decision in December 2012 to assign garbage pick-up to a city agency instead of private companies that had made high profits for years. However, the city was unprepared to take over the service and garbage piled up on the streets. No surprise, the handover was widely seen as a fiasco. Petro had to give in and private companies continued their services until the city was ready to finally take over. For many, this was a clear sign of mismanagement as it would be it in other cities around the world. Yet the difference is that in other cities the approval ratings for a mayor would fall and the chances to be re-elected would shrink. Probably the city council would pass a vote of no confidence. Not so in Colombia. Mismanagement is a reason to be fired from a democratically elected post and be barred from politics for a long time, basically destroying a political career. In December 2013, inspector general Ordóñez decided that Petro had to leave office due to reasons of mismanagement. Moreover, Petro would be barred from public office for 15 years. This was fully in the legal powers because corruption has reached such a high degree in Colombia that it was deemed necessary to have a strong person that would punish the many corrupt politicians across the country. However, this inspector general is different. Ordóñez is largely perceived not to be impartial but rather is running a crusade against the political left and just goes against right politicians when there is no way out. This time around, the most absurd reason is that Ordóñez also argued that the change to switch the garbage system from a private to a public system as illegal in the first place as it did not allow for competition and free enterprise. Clearly, Ordóñez is free to think that over a glass of wine with his conservative friends – but in his function such a political decision is not acceptable. Petro challenged the decision at Colombian courts including the Council of State, Colombia’s high court for administration dealt with his case and he asked as well the Inter-American Court of Human Rights to step in. 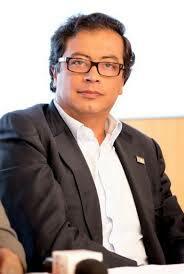 On the one hand there is Gustavo Petro, the (ex-)mayor who fought for the M-19 city guerilla of Bogotá and was arrested and tortured in the 1980s. He helped negotiate a 1990 peace deal that allowed the group to enter mainstream politics. He was elected to Congress and the Senate, where he exposed links between right-wing politicians and paramilitary groups. Petro was indeed the first to charge paramilitaries financed Uribe’s 2002 election campaign. He is wearing Armani glasses and loves to read the French philosopher Michel Foucault. On the other side is the inspector general who is very much vested in the bible and its ideas. Throughout his career as a judge he was mingling with conservative minds. In 2009, he was elected as inspector general – ironically also by Petro who was a senator at the time. Many people have criticized the homophobic statements of Ordóñez on homosexuality as well as on abortion. Back in December 2013, Petro predicted that the protests against his ouster would inspire a political transformation, with Bogotá’s central Plaza de Bolívar becoming a Tahrir where millions should rally for change. While early demonstrations filled the plaza, they soon dwindled besides a few dozens that occupied a small part of the square around the monument of Simon Bolívar. Now, Petro speaks of a “coup” that happened against him orchestrated by the political right through an “anti-democratic” decision. While it was not a coup, it was certainly anti-democratic – although Ordóñez followed the law. Moreover, it appears as a crusade against (successful) leftist politicians while those on the right connected to mafia and organized crime can continue to operate. 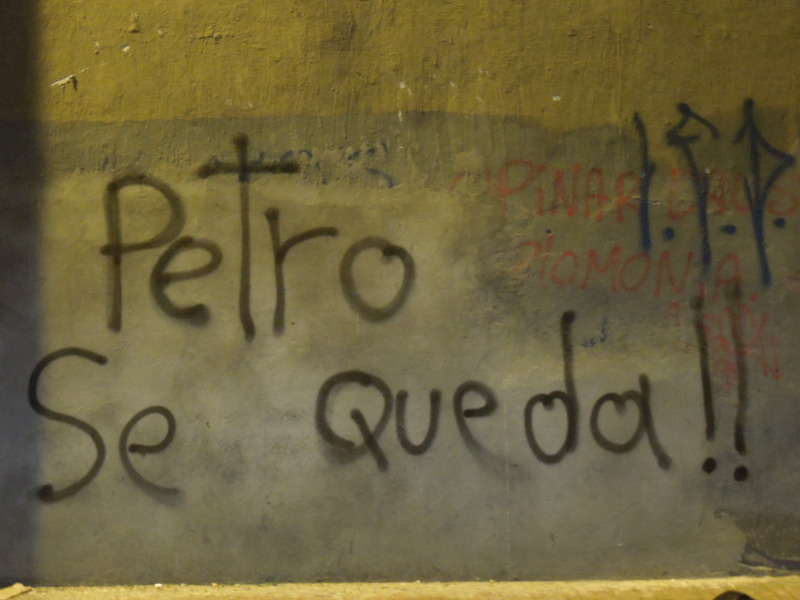 The slogan “Petro se queda” was seen all of the city during the past months. The courts turned down a last legal challenge of the mayor´s firing on 18 March 2014. Only hours later, an international human rights court seemed to rescue the mayor when it recommended protective measures which many assumed would prevent Petro’s firing. As Petro ran out of legal options in his fight to hang on to his job, the Inter-American Court of Human Rights (CIDH) in San José, linked to the Organization of American States (OAS), could have rescued Petro because Colombian president Juan Manuel Santos had indicated earlier he would respect the human rights court´s recommendations. Throughout the month-long battle between Petro and Ordóñez, the president tried to stay as distant as possible. However, Santos decided quickly that he would ignore the recommendation of the CIDH. He signed the document to dismiss Petro and installed Labor Minister Rafael Pardo instead of the leftist mayor. The announcement of the decision of the president came at a time while thousands were coming to Bogotá´s Plaza de Bolívar to celebrate the CIDH recommendation made earlier today that Petro should not be fired. Thus, instead of celebrations the crowd’s mood turned into anger against Santos. Santos has been described by the Guardian as a president who “is more of a Blairite pragmatist – a political shape-shifter who has moved successfully to occupy the central ground and now seems intent to leave his mark on history.” And also his decision on Petro was a pragmatic one, disturbingly pragmatic. He had to weigh between pleasing the left and the outside world and continue a Colombian tradition to follow recommendations by the CIDH. His image to the outside world is very important to Santos as he still dreams to receive the Nobel Peace Prize after successful peace negotiations with the FARC. On the other hand, he wanted to avoid attacks from former president Álvaro Uribe and his supporters who would have attempted to profit electorally at the presidential elections in May. Uribe is an ultra-right nationalist who might be sentenced by the International Criminal Court in The Hague for crimes against humanity during his time in office. Ultimately, Santos decided that Petro had to go. He decided that Petro’s supporters were too little in number and he would rather risk a backlash in the negotiations with the FARC before he would provide more risks not to be re-elected in May. Petro has not been a popular mayor and struggled with low approval ratings. He had constant quarrels with the media which did not help either. Many perceived him as arrogant. While he might have had some good ideas, many would agree that he was a very poor manager. Moreover, he could not deliver his promises as pointed out by the weekly Semana. At the same time, the ruling of Ordóñez made Petro actually more popular and his political career is far from over as Petro also announced himself in an interview with BBC Mundo. In a sense, Ordóñez did Petro a favor – what an irony indeed. The ruling of Ordóñez raised many questions about his powers as an inspector general. Since 2001, the inspector general has removed 816 mayors, 72 governors, 10 senators and 38 members of Congress. More have received lesser penalties. The inspector general unites all in one: he is police, prosecutor and judge at the same time. Even worse, he even decides appeals of his own rulings. Thus, not surprisingly Ordoñez upheld his own decision when Petro appealed. Nonetheless, many would say that a strong watchdog is needed due to corruption. However, changes of his powers will be unavoidable. Now, many are worrying that the decision of Ordóñez has a negative impact on the peace deal on Cuba between the Colombian government and the Revolutionary Armed Forces of Colombia (FARC), a guerrilla that fought the government for 50 years. Petro has been in many ways a symbol of integration as he changed caps from a guerilla to a politician and helped some 25 years ago that a negotiated agreement with the M-19 guerilla that he was part of would look for change through the ballot box and political office instead of attacks. However, as super-conservative inspector general forced Petro out of office the signal to the FARC is a terrible one. Why should the FARC trust an agreement with the government when they will be removed from office as well? Not only that, he will not be to run for office although he was a potential hopeful for the political left in the presidential elections in 2018. FARC negotiators themselves in Havana, Cuba, said that Petro´s removal raises suspicions about the government´s ability and intent to permit left-of-centre Colombians to participate in politics. Peace negotiations with FARC rebels continue in Cuba, while paramilitary politicians obtain political office and elected left-wing politicians are removed. At the same time, the FARC does not really have an alternative than negotiations due to the tough policies implemented by the government that has weakened the guerilla significantly in recent years. According to Petro himself, there is no room for left-wing politicians in Colombia because the rich and powerful try to put them into prison. Indeed, there has never been a leftist president in the history of Colombia – which probably makes this country one of the very few in the world that has not had a leftist leadership although there is almost a history of 200 years of elections. Moreover, in Colombia the work of (neo-)paramilitaries continues; they kill trade unionists, journalists and human right defenders. At the latest elections in early March, there was again vote buying and intimidation. Not much seems to be done about that despite the rhetoric from officials and the very bad situation has improved only a little bit. In conclusion, the decision to dismiss a mayor and bar him from office due to mismanagement of the garbage collection is totally out of proportion. There is still a long way to go. Next Any hope left in the UK for pro-European minds?